You control your helo with WASD, space bar, shift and the mouse. W to move forward, S to go backwards, A/D to move left/right, Space bar to go up and shift to go down. Weapons can be accessed via the numbers above your letters, 1 and 2 are usually for your guns and rocket pods, 4 is for ATGM's and 6 is for mortar teams. B is to blow...I mean use your Bino's, pretty straight forward use just press it when you think you're near infantry and they'll light up like a christmas tree for everyone to see for a good 30 seconds or so. You have to wait before you can use them again though, for some reason the bino's are so heavy that the co-pilot can't lift them up again until he's had another can of spinach, he probably always used a doctors note during PE lessons and bootcamp to avoid any weightlifting. Q is to use the godsend that is flares, without them MANPADS would have a field day ripping apart your multi-million dollar/ruble helo's and send you crying to your mummy demanding the nasty game give you your money back. Tier 1 pilots don't have to worry about using these but Tier 2 and up pretty much require them, they're usually 60 research points to unlock and only take up a small amount of your points when making squadrons but by god are they worth it. You need to be quick when using them however as they are not an automatic failsafe, the moment a warning comes up that you're being tracked by a missile you need to deploy them. Depending on how far away the missile is will give you an indicator on whether or not you'll fly for another day or end up a POW of the Vietcong. Up-close and you can kiss your tail rotor goodbye, if it's further away however and you time it right the flares can save you but it's probably best to put in some fancy footwork as well as deploying them, never ever rely on the flares to do your job for you, they are merely a tool that can help you save your helo from ending up as scrap. These little buggers are the bread and butter of your team....what did you think the gunships were?, not in a million years sunshine. These guys are quick, agile, made of cardboard and most importantly can spot tango's for you and your team from a fair distance away, something gunships and troop transports can't do. These guys also pack a reasonable payload of rockets and ATGM's as well as MG's (the Tier 1 American recon is fantastic for anti-infantry, you can't go wrong with 1500 rounds of M60 American freedom), with skill and a bit of advanced maneuvers you can easily take out a landing zone or a squad of infantry though I wouldn't recommend it. You wanna keep these guys at a distance and constantly moving though, they can't take much damage and are prone to getting critted easily so just keep back, spot the targets and let the rest of your team handle the rest. Also they can be used to bring down mortar fire on bases so you can quite easily sit back and pepper enemy bases from afar. These guys are your go to for capturing enemy bases and setting up ambushes. The tier 1 stages are simple enough so you only have to deal with taking over bases but once you get to tier 2 and up you'll find that you'll have to deal with enemy convoys as well which is where RPG teams come in (co-op doesn't have AI helo's yet so you don't have to worry about taking MANPADS just yet). These guys are slow mind so even though some come equipped with door gunners and a small compliment of guns/rockets you really don't want to be doing strafing runs with them, just sit back, let your team handle the AA/infantry and then swoop in with your infantry for a swift capture. 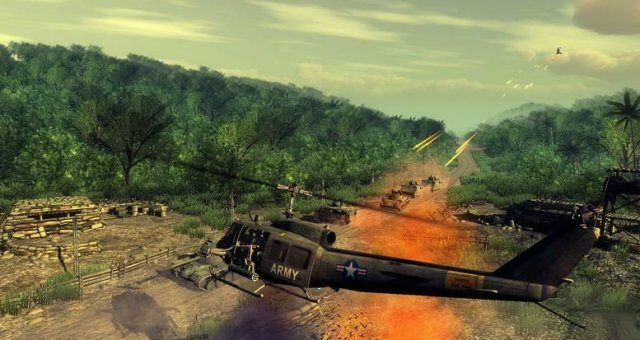 The go to unit for new players, I can guarentee you that most people will jump straight into these once they start up the game for the first time, fly over an enemy base and promptly get shot down because they were too stupid thinking that they can take anything on (if you're not one of these guys then you get a medal for not being a dumbass and being a credit to your team). These helo's should solely be used for taking out base defenses and enemy vehicles and should be coupled with recon units. They're usually equipped with the heavy gear such as a massive payload of rockets and a large gun so they're very adapt at taking out bases and heavy vehicles. You wanna keep them at a distance though and not at ground level unless you're hiding behind a mountain, they're actually quite fragile beings and get their feelings hurt a lot by MANPADS,RPG's and anything with a gun which is why it is critical you unlock flares on these badboys to keep those pesky missiles away from your precious helo and not hover in one spot. The Soviet gunships are an exception to the rule however, they're optimised for assault and transport duty so you can get away with utilising them for both roles. Now onto the factions, there's only two in at the moment but they both have they're own unique playstyle for them to stand out. The good ol' US of A, deliverer of freedom, finder of WMD's and your friendly annoying neighbour who insists that your garden needs a good dose of napalm and freedom simply because apparently the vietcong is hiding in it, also they don't like the colour red, anything that sounds foreign and will get defensive if their freedoms are in jeopardy. They're your go to faction for specialised units and probably what a lot of new players go for as they contain a lot of iconic helo's and the most simple faction to use. Recon is for recon, transports for transports and gunships for ♥♥♥♥ing up anything within sight, you honestly can't go wrong with their units as long as you familiarise yourself with what they can and can't do. The things they can't do is turn a gunship into a transport at the same time which is where the ruskies come in. Greetings comrade and welcome to the glorious Soviet union, get used to very cold winters/summers/every day of every year, a lack of food and proper housing, indoctrination to be obediant to the proletariat that claim to be your equal and they hate the colours red white and blue. They're not as specialised as the Americans but they make up for that by being able to fill a multitude of roles and have fairly sturdy aircraft with the firepower to boot. You can just as easily fulfill a variety of roles with these guys without having to swap aircraft like the Americans have to, they're a tad more advanced though so unless you know what you're doing and know how to use these helo's effectively you're better off staying with the capitalist pig dogs. Ranging from 7.62mm calibers up to 20-30mm, these are your mainstay guns that deal with infantry and lightly armoured targets with the exception of 20-30mm calibers which can easily defeat heavy armour as well as anti-infantry duty. You can use them to destroy AA installations as well but it is recommend you use more long range weaponry as to stay out of their field of fire. Your go to for dealing with anything from afar, they can destroy AA installations, squads of infantry and pretty much any vehicle with ease. However there is a drawback, unless they're guided most of them are wildly innacurate and thus must be fired in salvos, you also need to give a bit of lead on your target as they will drop after a certain distance so if you're firing at a far away target you need to point the reticle above the tango for you to be able to hit. I like to call these pot-shotters simply because that's essentially what they're used for. They don't seem to have much of an effect as opposed to rockets so you need to be very accurate with them and account for the fact that they will drop out of the sky very quickly, they're short ranged weapons so you also need to be quite close. Once in range just saturate an area with grenades and send charlie packing. Now that that's out of the way here's a few tips, if you move your mouse up so the helo is pointing upwards not only do you fly up but the helo also slows down, this is essential if you're trying to make precision landings without crashing into the nearest tree/house/mountain/other player. 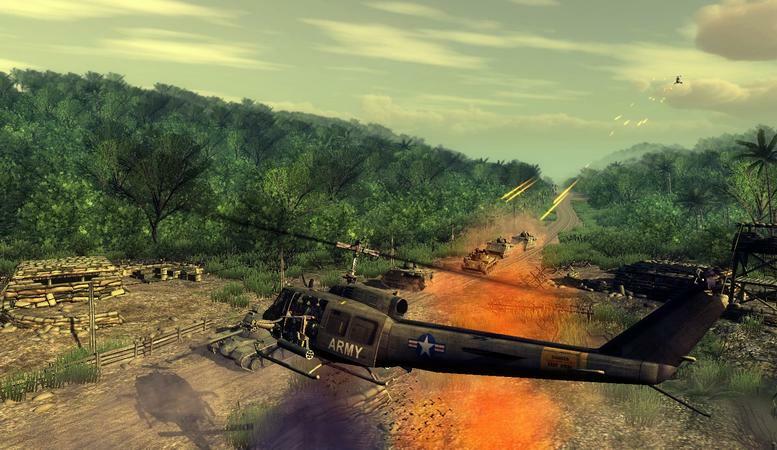 This can also be coupled with the A/D keys to be able to make sharp turns without having to make long passes and it can help you to bring your guns/rockets to bear quicker, just don't do this maneuver when near MANPADS and RPG'S as you will get shot down before you can say "Welcome to Vietnam". Also if you point the nose down by pulling the mouse down you'll make the helo go a lot faster as opposed to holding down the W key, you wanna be liberal with this though as the faster you go the harder it will be to make a turn or slow down and it is very easy to run into the map border or a mountain. Just simply point the nose back up when you want to slow down and the helo will come do a dead halt allowing you to re-adjust. Also you might be tempted once out of rockets/troops to just kill yourself to respawn faster, don't do this. You're better off to your team (especially if you're recon) staying alive and lighting up targets with your guns or door gunners and then returning to base to resupply. Plus if you kill yourself then you have to wait until the aircraft is repaired which can take a while whereas by simply landing and jumping into another helo you'll actually find that your previous helo will be repaired and rearmed much much quicker and allow you to get back into the fight a lot faster, and you'll be doing your team a favour if for some reason you're the only guy with recon or troop transports by doing it this way (plus if you bring back a damaged helo in one piece you get a supple bonus amount of experience!). Another little tip, the devs actually put in a semi realistic detail in that tanks are completely invulernable from the front!. Yup your rockets/ATGM's and vulcan miniguns ain't going through that in a million years, you actually have to flank heavy vehicles and assault them from the sides/rear and top of the tanks. So if you wanna take out a convoy hit them from the rear, with any luck and a bit of fancy aiming you can take out the convoy in one strafing run.